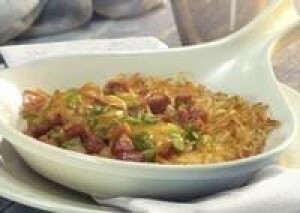 *Shortcut to make a Creole sauce: Mix ½ cup of mild salsa with ½ teaspoon of Creole seasoning, and mix to taste. Preheat oven to 400 degrees. Butter an 8 x 8 inch baking pan. Refresh potatoes by adding hot water to the fill line. Let stand for 10 minutes. In a non-stick skillet, heat 1 tablespoon oil over medium high heat. Drain the potatoes and add to the skillet. Cook on one side only until the edges are golden. Transfer potatoes to the prepared baking pan. Add the remaining teaspoon of oil to the skillet, heat, and add the celery, onions, and green bell pepper. Cook until softened and arrange over the potatoes. Add the sausage to the skillet and cook until hot. Arrange over the onions/ peppers. Spoon the sauce over the sausage. Sprinkle the cheese over all and bake until the cheese has melted, about 10 minutes. Sprinkle the green onions over all.